Dad kept a number of souvenirs of his military service in the Great War, which have remained in the family ever since. Among the artefacts are the ones displayed below. 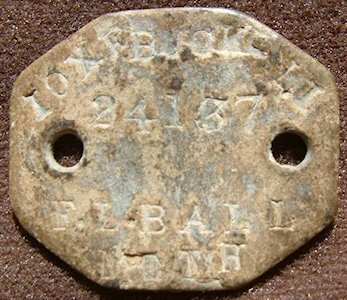 The British Army issued identification tags from the beginning of the First World War. The tags were made of fibre, one in red and one in green, and suspended around the neck by butcher's twine. 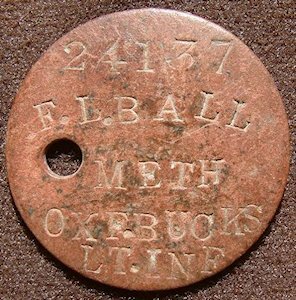 Dad's tags are imprinted with his initials and surname (F.L.BALL), service number (24137), regiment (OXF.BUCKS LT.INF) and religious affiliation (METH). 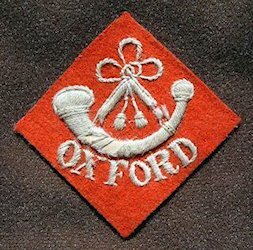 During the Great War, the Oxford and Buckinghamshire Light Infantry raised 12 battalions (17 in all), six of which fought on the Western Front, two in Italy, two in Macedonia and one in Mesopotamia. 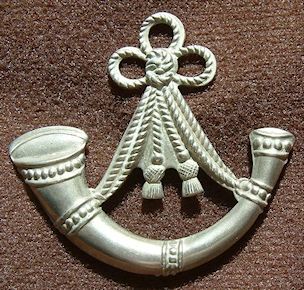 The regiment won 59 battle honours and four theatre honours. 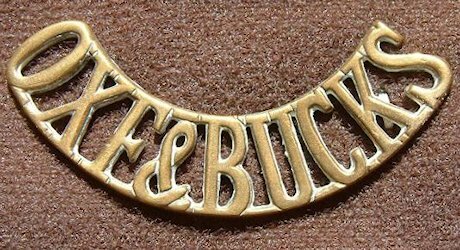 Many gallantry honours were awarded to the Oxford and Bucks, including two Victoria Crosses—the most prestigious honour for bravery in the face of the enemy. The pair of medals and corresponding ribbons were awarded to Dad at the end of the war. The 'silver' medal is the British War Medal, a circular 32mm diameter silver design. The obverse shows a King George V bareheaded effigy, facing left, with the legend: GEORGIVS V BRITT : OMN : REX ET IND : IMP : (George 5th, King of all the Britons and Emperor of India). The reverse shows St George naked on horseback, armed with a short sword. The horse tramples on the Prussian shield and the skull and cross-bones. Just off-centre, near the right upper rim, is the sun of Victory. The dates 1914 and 1918 appear in the left and right fields respectively. 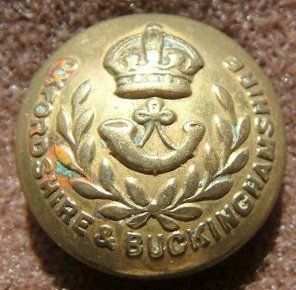 The British War medal was awarded to officers and men of British and Imperial forces who had rendered service between 5 August 1914 and 11 November 1918. The 'gold' medal is the Victory Medal, is a 36mm diameter circular copper medal, lacquered in bronze. 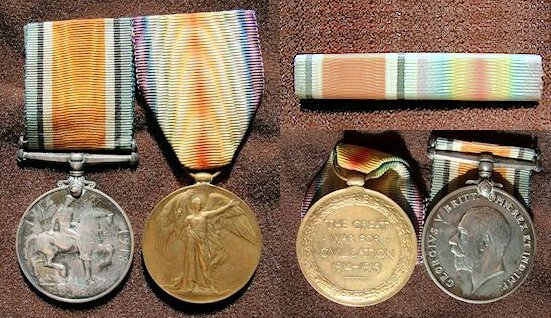 To qualify for the Victory medal one had to be mobilised in any service and have entered a theatre of war between 5 August 1914 and 11 November 1918. The medal was issued within the British Empire as a result of an international agreement at the Inter-allied Peace Conference immediately preceding the Treaty of Versailles The obverse in the British Empire medal shows the winged, full-length, full-front, figure of 'Victory' (or 'Victoria') with her left arm extended and holding a palm branch in her right hand. The reverse has the words ‘THE GREAT / WAR FOR / CIVILISATION / 1914-1919' in four lines, all surrounded by a laurel wreath. As a pair, the British War Medal with the Victory Medal were known colloquially as the "Mutt and Jeff" pair.